No, no, no... NOT outside, but at Peachy Keen Stamps it's looking a whole lot like Christmas!! Welcome to our annual Christmas in July Release! Here we are celebrating Christmas in the midst of Summer and 4th of July celebrations! 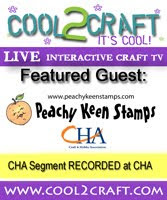 This is a much anticipated event for us, and tonight we kick off our sneak peeks by showcasing five adorable stamps sets that will have you excited and ready to get started on your 2014 holiday projects. You DO know there are only 174 days left until Christmas don't you? Take a break from the Summer heat and grab something cool to drink and join us as we share projects made with PKSC-31 July 2014, PK-1410 Christmas In July Faces (Assortment and 1 1/8" sizes), PK-1412 Snow Hugs Snowman, and PK-1413 SMILE Snowman. Here's my card for tonight's round of sneak peeks. I colored this cutie with Copic markers using X-Press It Blending Card. I cut the snow drifts out of white card stock and coated the surface with Versamark, then Heat and Stick powder from Stampin' Up. After melting the Heat and Stick powder with my heat gun, I added the chunky glitter from Marth Stewart and heat set again. This works so well and the glitter will not come off at all! I LOVE that technique! The finishing touch was the knit ribbon and icy looking beads that were in my stash and both are from Stampin' Up!. Be sure to stop by the Peachy Keen Stamps Blog where you'll find even more Christmas creations from our talented team members, and be sure to leave your comments for a chance to win ALL 5 stamps sets you see showcased tonight. One lucky winner will be chosen from all the comments on all of the blogs and that winner will be announced in the following day's post. The more you comment the better your chances of winning! Good luck!! Tomorrow night we have five more stamp sets to give you a peek at, and then on Saturday, July 5th we'll be back with our Release and Reveal Blog Hop along with a chance to win a $50 PKS Gift Certificate! Thanks for stopping by! Well see you tomorrow night for more fun Christmas in July projects! This card is adorable Lori. Beautiful Job. The snow is dazzling. Beautiful, beautiful card, thanks for sharing! Wow! So many fun details on your card I love it! Great job shading the snowman too! This is so cute!! I love that bow and the chunky glitter and of course that little snowman!! Cuteness overload!! Hugs!! Pretty card! That glitter snow is so sparkly and it brings out the snowman even more! I also love the green bow and how it pops the green on the snowman too! Wonderful! your snowman card makes me smile!!! I just LOVE it to pieces!! The sparkly snow is Darling! As for the snowman, he is so SWEET!! !adorable card!! The glitter just helps make your snowman awesome. You did such a great job. Thank you for sharing. Great coloring and paper choices. The snowmen are so adorable. Fabulous card. What an ADORABLE card Lorie!!! I LOVE this little snowman and the glitter is awesome! Great release, looking forward to see what else the Peachy Keen team has in store for us. What a cutie! Love the snow drifts and such a sweet sentiment! Great sneak! Thanks for sharing! Awww, I just love it. Ok...I call DIBS on this one!!!! Hee! It's just too cute!! And I promise to keep him from melting in this Phoenix heat!!!! ;) Love it Lorie!!! Oh my gosh...what an adorable snowman! I love the cute scene and wow, look at that shimmery snow! Love it! Your card totally rocks! This card is gorgeous! I think this is going to be my favorites stamp of the whole weekend. He is just the cutest thing ever! very cute card and so darn sparkly. i love it!